Eastern Railway requires candidates to fill in 02 Group ‘C’ posts under Cultural Quota. The application window closes on August 07, 2017. Key details with regard to these posts, educational qualifications required and selection and application procedure, as mentioned in the official Eastern Railway recruitment notification, are listed below. Candidates need to have Degree/Diploma Certificate in respective discipline only from Government Recognised University/ Institute. Between 18 years and 28 years as on Jan 01, 2018. OBC candidates get 03 years and ST candidates get 05 years relaxed. Candidates will be selected on the basis of a written test and talent assessment. The written test will consist of objective type questions amounting to 50 marks. Talent assessment round will consist of Practical Demonstration amounting to 35 marks and Testimonials amounting to 15 marks. Candidates need to enclose with the application form all the photocopies of certificates in regard to proof of age, educational qualifications, cultural qualifications and other qualifications, caste certificates (from appropriate Civil Authorities in standard proforma with Photograph) and other certificates duly attested by a Gazetted Officer. Candidates need to send 02 self-addressed envelopes (size 23 cm × 10 cm) along with the application. Two recent passport size photographs (without cap and/or coloured glass) with their names written at the backside should be clipped along with the application form. candidate with date to be pasted on the application form at the space provided. INR 500/- for General/OBC candidates. INR 250/- for SC, ST, Ex-servicemen, PWD, Women, Minorities and Economically Backward Classes. All payment to be done through Indian Postal Order drawn in favour of FA&CAO, Eastern Railway, Kolkata payable at Kolkata. Eastern Railway is one of the 16 zones of the Indian Railways. Headquarters is at Fairley Place, Kolkata, this zone has the distinction of being one of the largest and hi-tech ones, stretching 2500 KM spread over four divisions: Sealdah, Howrah, Asansol and Malda, out of which more than half of the route is electrified on 25 KV AC traction. Apart from the 4 open line divisions, this railway zone has 3 major workshops situated at Liluah, Kanchraparaand and Jamalpur besides a mechanical signal workshop at Howrah. 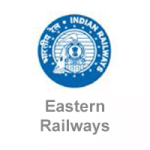 Eastern Railway frequently releases notification concerning recruitment for a range of posts via their Railway Recruitment Cell, some of which include Trade Apprentices, Station Master, and Ticket Collector, among others. In addition to general quotas, the recruitment board also take in eligible candidates under Sports and Cultural quota.